'Pizza Ponte' walk up Pizzeria entrance.. 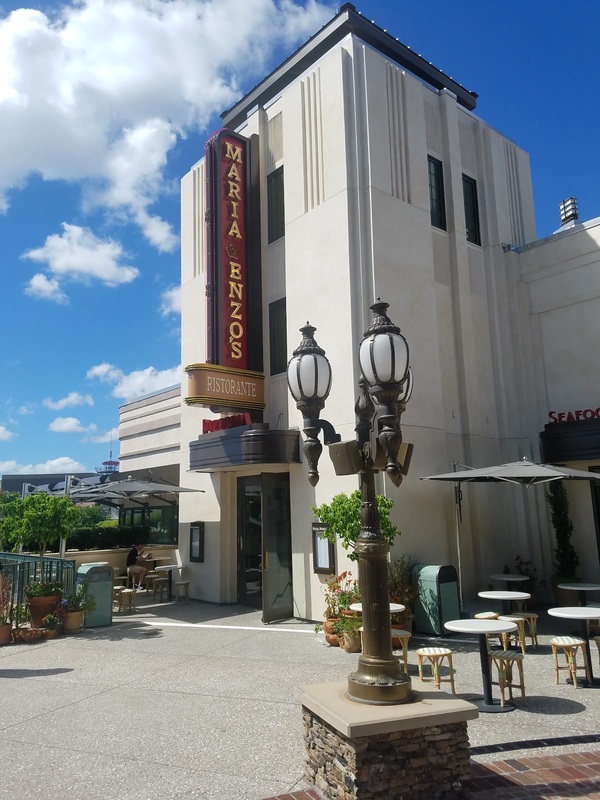 This week I had the pleasure of dining at Pizza Ponte at Disney Springs for the very first time. In case you didn't know.. there's a walk up entrance where you can order sandwiches and Pizza in the same building Maria & Enzo's is located, with seating both inside and outside. The lunch I had was SO good, I even brought my bride back in the evening for dinner! 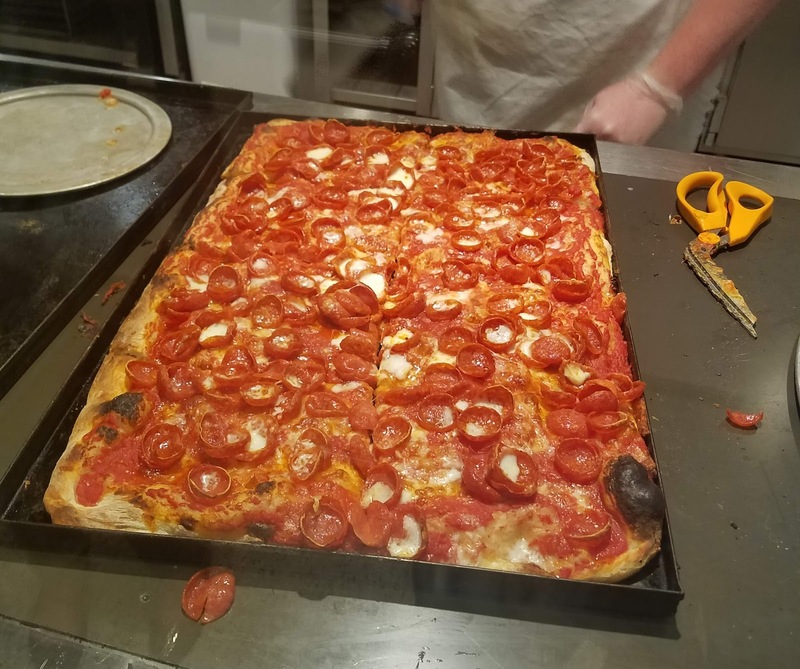 Visiting twice in one day allowed me to sample a few types of pizza for this review. 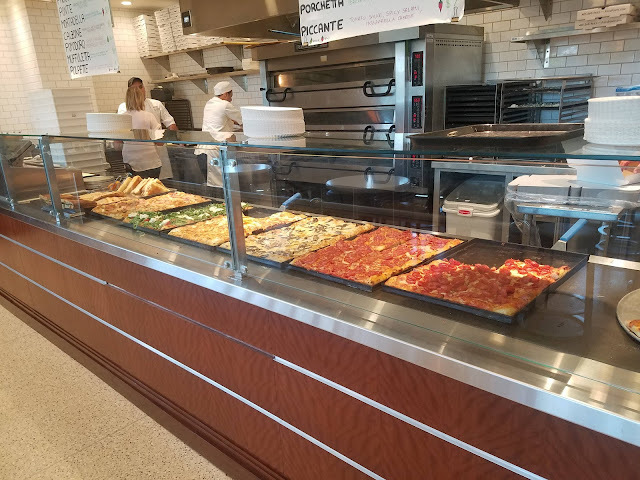 The first thing I saw (and smelled) upon entering the Pizzeria, were the HUGE Sicilian style pizzas. I instantly knew the kind of pizza I was going to order. Not because I was craving some nice thick slices, but rather.. the styles they were serving up had my mouth watering! I settled on the Funghi, and pepperoni slices. 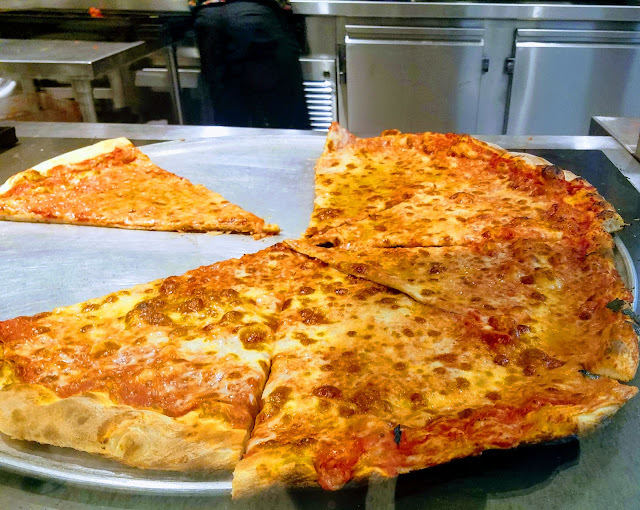 I was able to eat them both, but even with skipping breakfast, it was all I could do to put these giant slices away. Here's what they looked like..
Beautiful Sicilian pie fresh from the oven. Not sure this pan would even fit in my oven at home. 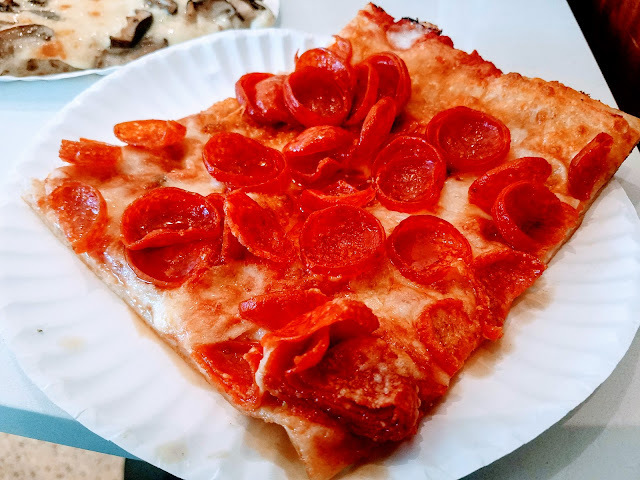 Have you ever wished your slice of pizza had more pepperoni on it? I swear that this was the very first time ever.. that I didn't long for more pepperoni on a slice! This piece of pie had between 30 to 40 slices of fresh, thick cut pepperoni that curled up as it cooked, making for some beautiful little pepperoni bowls atop my slice. It truly was a thing of beauty, and I kept tossing pieces of pepperoni on my daughters plate, because I almost felt guilty that I was indulging too much. The visual isn't the best in regards to impressing upon you how big this slice really was, but as you can see.. this rectangular slice was as big as the paper plate it was served on. Absolutely incredible. My pepperoni craving is now satisfied for the next three months! The next slice I had for lunch was their 'Funghi' Slice. 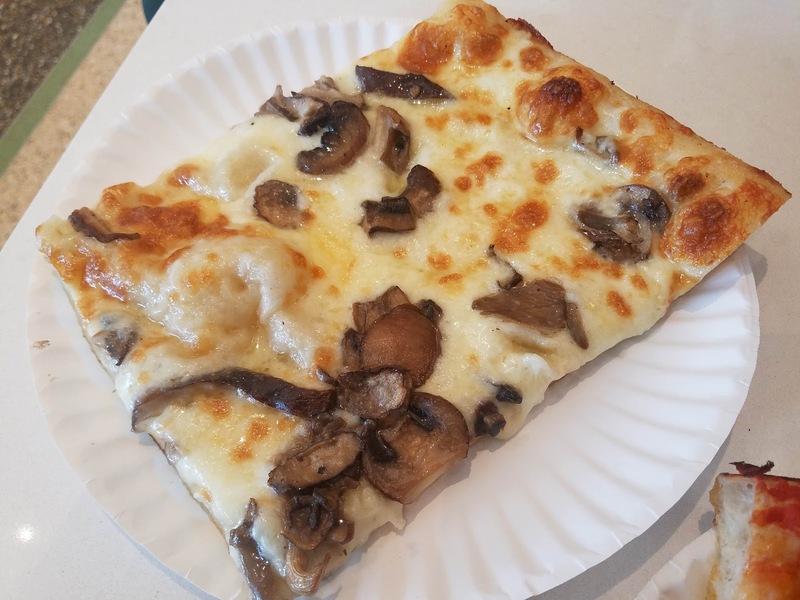 A super simple slice with Forest Mushrooms, Fontina and Mozzarella Cheese. 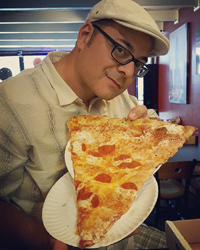 This slice was so delectable, I was taken to heaven with every bite. The cheese blend was buttery, rich and a wee bit nutty. Just when I thought it was on the border of being too rich, the incredible forest mushrooms and perfect crust balanced it all out. 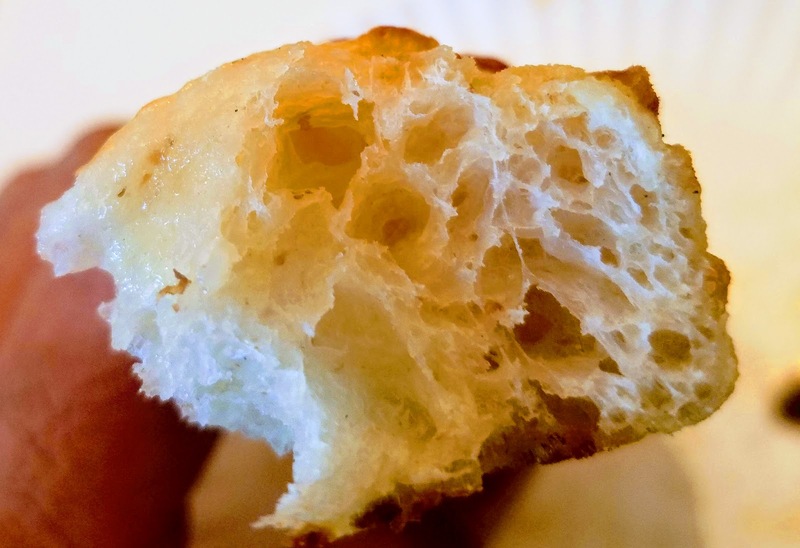 The crust smelled and tasted like fresh baked bread right out of the oven, just as thick crust should. Absolute perfection! The Cornicione was on point! 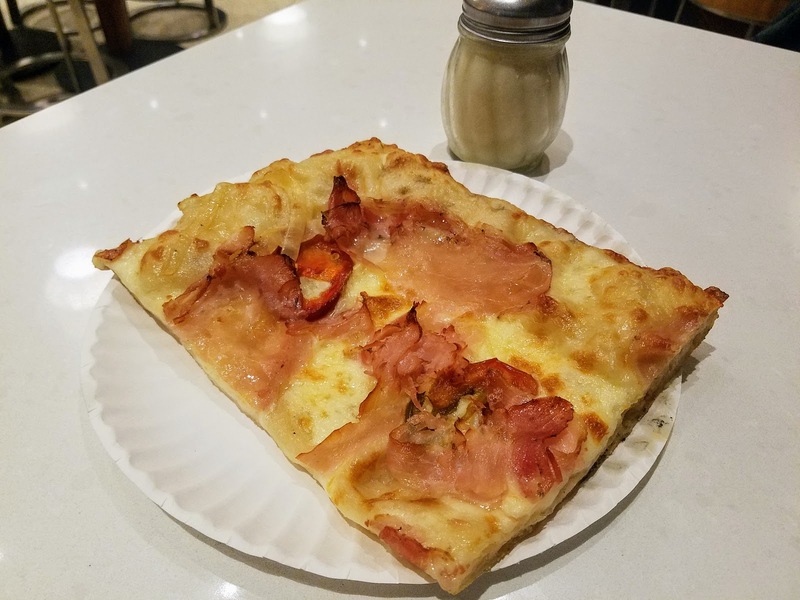 For dinner, I ordered up a 'Porchetta' Slice. A very simple looking, but incredibly tasty slice that sported Mozzarella, peppers, onions, and Porchetta (Italian Pork Roast) sliced super thin, with a taste similar to bacon. The Porchetta was not as bold or as salty as bacon, but was instead more savory. The peppers added a pop of spiciness that filled your mouth with flavor, and the onions also helped the slice along as well. Every bite tasted a little or a lot different than the last, depending on where you sunk your teeth into on the slice. It truly made for a great pizza eating experience. Again, the great tasting crust was a real star, especially at the end. 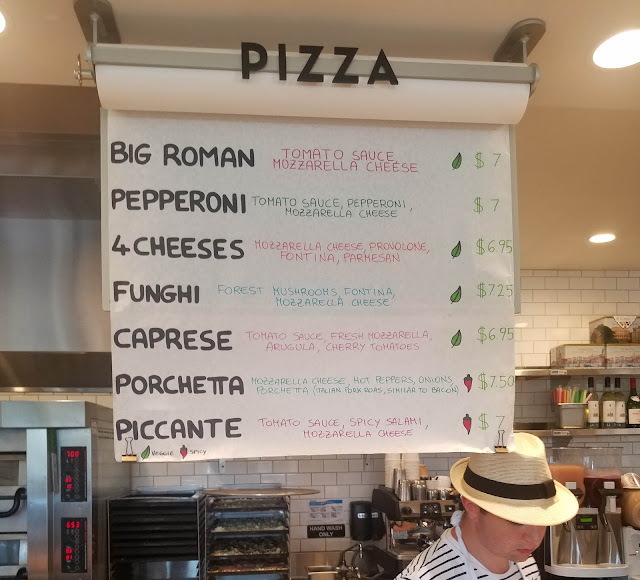 This Pizza is a great value as far as Disney Springs food prices go, and one slice will fill up the average person. Heck.. I can eat like a horse, and could barely finish two slices at one sitting. The Pizza is LEGIT my friends, with the Pizzaiolos tossing, stretching and baking them all day long. Their commitment to quality is evident, and Pizza Ponte will definitely be one of my regular haunts at Disney Springs from now on.